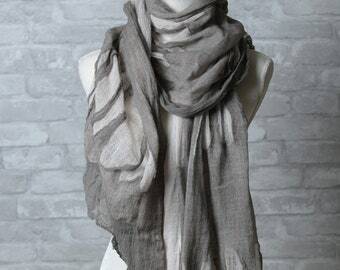 Welcome to FrogAspect, a contemporary textile jewelry and scarves online boutique. 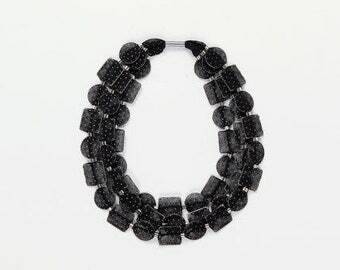 Also available as wholesale - please contact us. 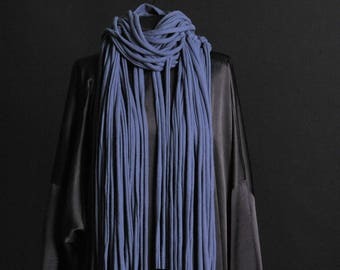 here on Etsy i offer you my textile necklaces & bracelets collection made all from spandex .and in addition a unique line of sculptured and versatile scarves, that i hand dyed, manipulate and create from different variety of textiles. frog items are sold on high end boutiques around the world. It's perfect for what I wanted and very well-made. The packaging was on-point as well! Great product. (I ordered the metallic black). Working on my new gold collection. Amazed in every step of the production how the fabric is slowly turning in to a completely new material ! Preparations for exhibition in Milan . Hi! 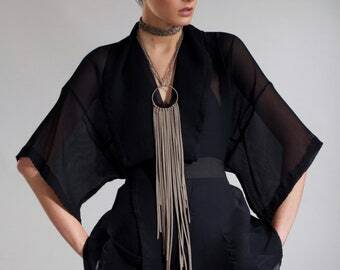 My name is Einat Burg Cohen and I am a textile accessories designer for woman. in the last 2 years I livein modiin , a city located between Tel Aviv and Jerusalem. i moved from Tel Aviv who has been my city for the past 15 years. My studio is still in tel aviv and located in the south, near jaffa flea market and the beach of the Mediterranean sea . I share my studio with a product photographer. so, yes. you guest right..it is very convenient :-) each of us have our own space to work which fuels a creative and inspiring atmosphere. My creative process begins with looking around,exploring shapes and textures around me every minute of the day. usually i'm sketching my ideas and at the same time looking for materials who will excite me. for me, the material is in the center . i'm stretching his boundaries to its final limit and what happens in the process itself lids me to the final shape. 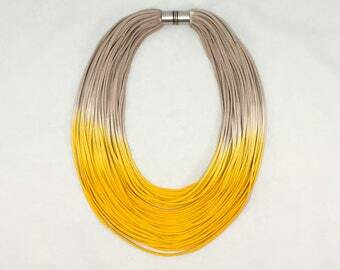 * textile necklaces collection made of spandex and plated brass combinations . 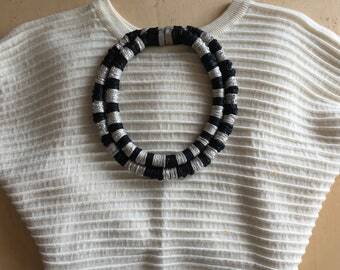 it includes all kinds of styles: from gentle casual necklaces, Boho chic, African style and statement necklaces. 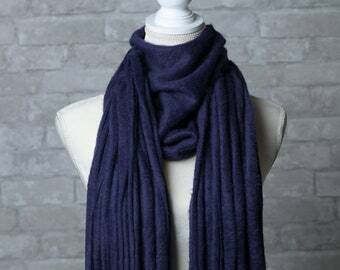 * scarfs collection . 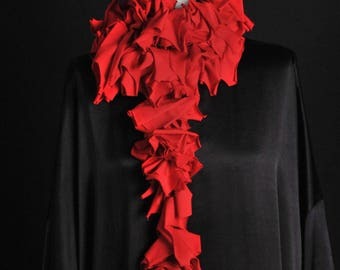 made of different materials : viscose,cotton,gauze ,silk chiffon,polyester,linen. all of the styles are based on versatility and textile manipulations. rich in shape and texture and compliment any clean outfit. The most important thing to me is a satisfied customer. If you purchase one of my items and are unhappy with the fit, I will replace, refund, or work with you to find a solution that leaves you satisfied with your purchase. an out sourcing organization who helps mentally ill people get back in to the labor market by collaborating with different businesses. For them this kind of work is perfect. clears their minds and make them confident in what they do. for me it is a great privilege to be able to help them financially and mentally and getting back hand made elements handle with care and love. 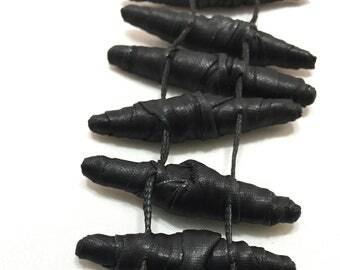 In my shop you can find alternative textile necklaces for evening and casual. from statement to simple. all made from different kinds of spandex/ Lycra fabric. 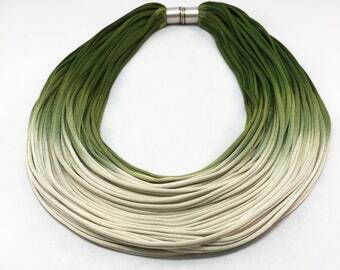 the elasticity and the shininess of the spandex makes the look of the necklaces exceptional and unique. 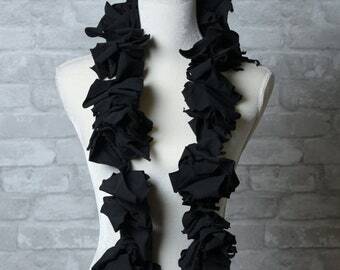 in addition i also have a scarves collection,sculptured and versatile, rich in shape and texture . inspired by Japanese design. i believe in changeability in every living things to still objects. that's why in my eyes everything is possible. all we need to do is try and explore. 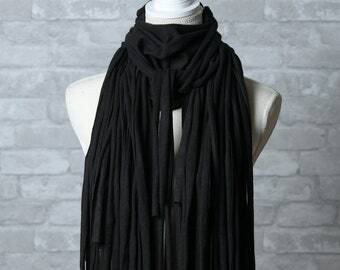 1.If the accessory/clothing we sent have any quality defect, please contact us in 3 days after the receipt, we will contact you as soon as possible and we will replace the product and pay the shipment fee. 2.100% Refund within 15 Days. Item must be returned within 15 days of receipt and be in the same condition in which it was received. Shipping costs will not be refunded and buyer is responsible for shipping items back to the seller. 3.Please first contact us before return , we will give you the return address. If parcel lost or sent to the wrong address, we will not refund or exchange. 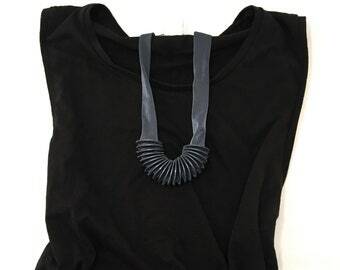 4.If you order the wrong size/color, you can free exchange the correct size (only the same design). But you need to pay the shipment. Before contact us we suggest that to some design that relatively easy to modify, you can look for local tailor to modify, to save shipping cost. Please first contact us for the return address before return the clothes. When we receive the package, we'll send the right size for you. 5. If customized color doesn't fit you, we will design again for you if the different color you picked available. When remade, in order to avoid errors again, please reconfirm your preferences. 6. The design is according to the pictures, maybe a bit different from the real object. Please consider the purchase after decision. paypal is a good payment method (includes Visa, Mastercard, Discover, American Express). we send package by Airmail about 10-21working days than you can get the package. takes about 3-7 working days to arrive. If express mail is necessary please contact me and we will arrange it (17$-35$ depending on the weight of the package and the country of residence). you can always ask for custom not mentioned and we will try our best to please you. A: Shipping with the registered mail officially takes between 10-21 business days. Shipping to Australia is between 5-24 business days. Shipping to Europe takes officially between 3-14 business days. A: Express shipping overseas is usually an additional $25(depends on the destination), and takes between 2-5 business days. Q: Do you accept custom made? A: In most cases, I take special orders, it depends on the design and the time frame you will have. Please contact about those special requests. A: Inside the invoice of your order you will have a tracking number, which is clickable. Clicking on it will open a window where you can find the current status of your parcel. Please consider that it may take few days for the tracking number to be updated. Q: What should I do if I want to purchase more items than the quantity in the shop? A: Please contact me and I'll add the stock for you.